There’s something always exciting about seeing snow fall. I don’t even care if it accumulates, to be honest. It’s just pretty. I also love the cold weather. You can always put more clothes on, but you can’t walk around naked when you’re just blistering hot. You know I have a point here. When we went to the grocery store last night (with the rest of the crazies), it was clear we needed to prepare to not leave the house in the morning and cook breakfast at home. We typically have a full breakfast on the weekends when we can, as breakfast/brunch is my favorite meal. The brainstorming didn’t last long, because my love was pretty quick to suggest one of our Grit Bowls. When my love wants a Grit Bowl, the man gets a Grit Bowl. It doesn’t hurt that I love them, too! We bought the sausage, eggs, and cheese, and then we headed home. No, we didn’t forget the grits. We already had the grits at home that we purchased from Old Mill of Guilford directly when my Mom went to visit it recently. They are truly the best grits, and they’re local! I’m pretty sure you can order your own at this link. This morning when we woke up, I got to cooking. Granted it was hard to get out of bed when it was snowing outside. However, it reminded me that breakfast is just another way of showing someone you love them, by wanting to take care of them and fill their bellies with deliciousness and fuel for the day. 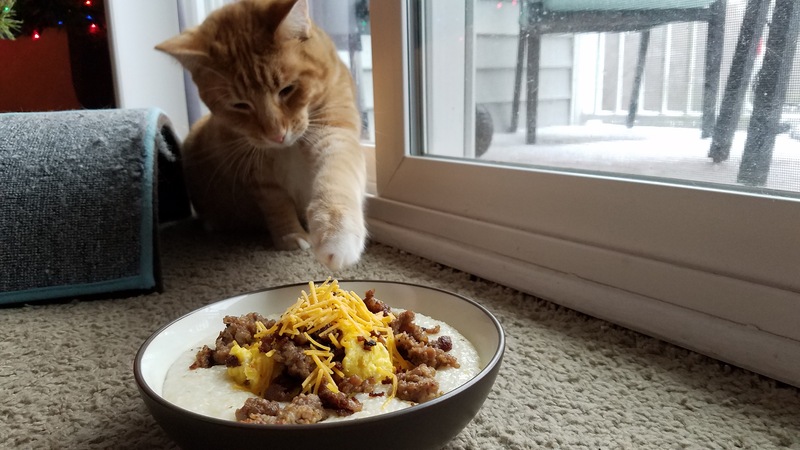 Breakfast truly is love. Not that you need a recipe, but here’s what we put in our Grit Bowl. As with all throw together recipes, use your favorite brands. It makes it taste so much better than skimping out. Follow the instructions to prepare the grits. I find that these take the longest of the ingredients to get ready for bowl assembly. I start boiling the water for the grits before I start anything else. Cook out your sausage, and while cooking it, break it up to where you have sausage crumbles in the end. I would say to just buy a bag of pre cooked sausage crumbles, but that takes out half the fun when it’s time to cook your eggs. While cooking your sausage, watch your water for the grits, because I bet it’s about time to add the grits to the water and get them cooking. Take the sausage out of the pan with a slotted spoon to leave the grease behind in the pan. Now, obviously, if your brand of sausage leaves an exorbitant amount of grease behind, you might want to do the smart thing and remove a little bit of it. Use your common sense. After scrambling the eggs in a bowl with salt and pepper, pour them into the pan with the leftover sausage drippings. Scramble just the way you like them. By this time, your grits should be done as well. Give them one final swirl in the pot with a 1/2 stick of butter. Don’t judge me. Time for assembly! Split the grits between your two bowls. 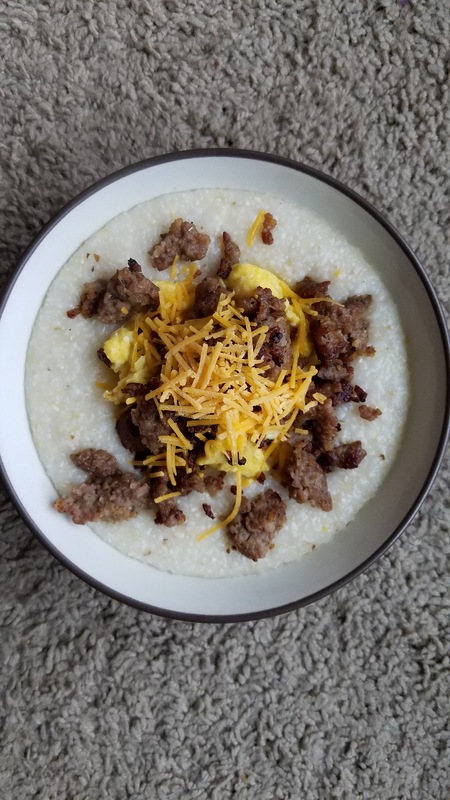 Eggs split between the bowls on top of the grits. 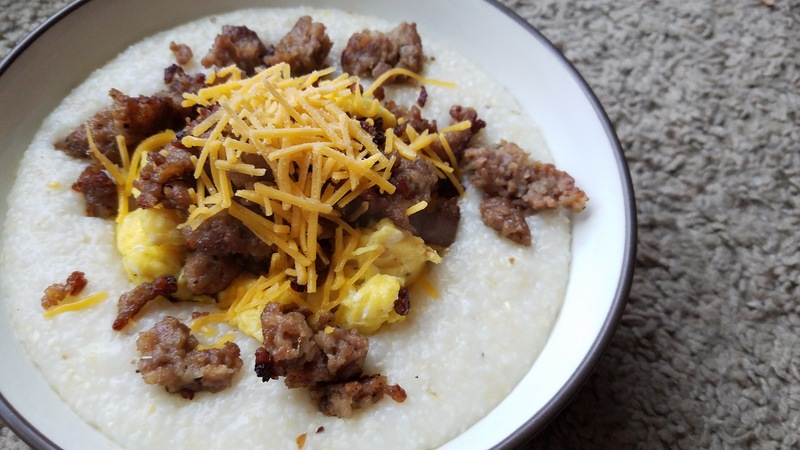 As much sausage as you want on top of the eggs and grits. (We typically have leftover sausage, but you can put this in a freezer bag and freeze for a quick heat up sausage need in the future.). Sprinkle with cheese to your hearts content. Always the final step…Serve with coffee! ….yes, I was photographing on carpet…a little too close to one of our cats. Ha. Next Post Happy New Year to you and yours!